Grab the opportunity now! 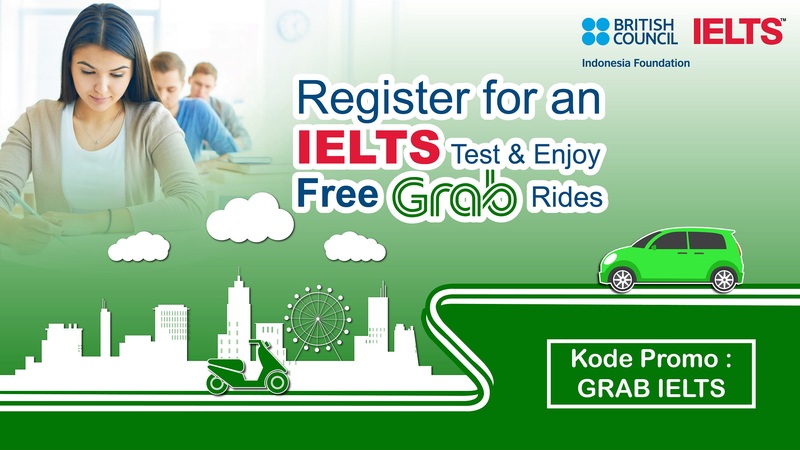 Register for a paper-based or computer-delivered IELTS from now until end of May 2019 and receive IDR 100,000 Grab voucher for your trip to the IELTS test venue, or travel anywhere you want with Grab. How to get the Grab voucher? The offer only applies for May - June 2019 test sessions. You must key in the promo code in the “promotion code” field in British Council IELTS online registration page. Promo code is “GRAB IELTS ID”. The offer applies for ANY weekday computer-delivered IELTS test session (Monday – Friday) from now until end of June 2019. No promo code key in required during the registration process. For both IELTS test takers with British Council Indonesia Foundation, you will also receive our tailored IELTS Online Preparation material – Road to IELTS Last Minute. This includes nine videos giving advice and tutorials, 100 interactive activities and two practice tests for each of the four skills — and it’s free when you register for IELTS with the British Council! Register for an IELTS test NOW to enjoy the above offer! The offer only applies for IELTS test takers with the correct promo code insertion for paper-based IELTS. The offer only applies for paper-based IELTS and IELTS for UKVI test sessions available in May – June 2019. The offer is not applicable for IELTS Life Skills. The Grab voucher will be delivered in the ‘Confirmation Letter’ sent 3 days before your test date. In case of dispute, the British Council Indonesia Foundation has the right of final decision.